A set of six silver martini glass charms with holding ring. Each decorative charm is easily attached to the stem of a wine glass so guests will always know which glass is theirs. Crafted from solid pewter with lustrous silver finish. 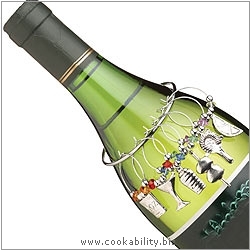 The holding ring keeps the charms neatly together and will fit any size wine bottle.